A table is used in the process flow for a job. You want to delete the metadata for a column in a table, and you want to trace the impact this would have on later objects in the process flow. Use impact analysis to trace the impact of the selected object on later objects in the process flow for the job. Alternatively, you can select the object in a tree view or in the context of a process flow, select Actions from the menu bar, and then select Analyze. 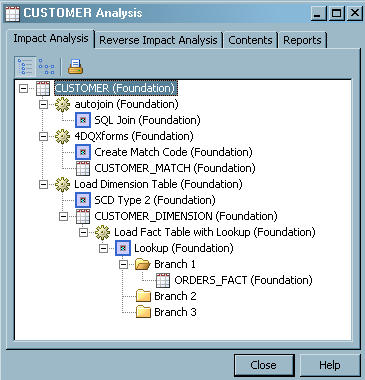 The following display shows the tree view of the analysis of a table named CUSTOMER. In a tree view or in the context of a process flow, right-click on the metadata object for the table that contains the column to be analyzed. Select Analyze. In the Analyze window, right-click on the metadata object for the table, and then select Analyze Columns. Select the column that you want from the Available columns pane. Use the arrow key to move it to the Selected column pane. Click the OK button. A new window appears. 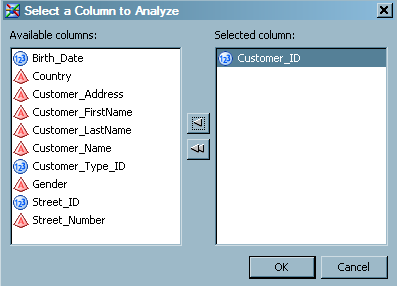 In the following display, this window shows the result of an analysis performed on a column named Customer_ID in a table named CUSTOMER. CUSTOMER.Customer_ID (Foundation): specifies the selected column, Customer_ID, in the table CUSTOMER, which is registered in the Foundation repository. Load Dimension Table (Foundation): specifies the job, Load Dimension Table, to which the Customer_ID column is an input. The mapping type is 1:1. 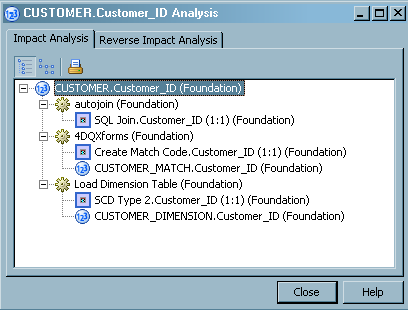 SCD Type 2 Loader.Customer_ID (1:1) (Foundation): specifies the transformation that maps data from the Customer_ID column to a column later in the process flow. The mapping type is 1:1. CUSTOMER_DIM.Customer_ID (Foundation): specifies the target column, Customer_ID, in the table CUSTOMER_DIM. The target column is loaded with data from the selected column. To view the results as a graphical display, click on the icon for the Diagram View. The same analytical results as shown in the preceding hierarchical display are shown in the following graphical example. 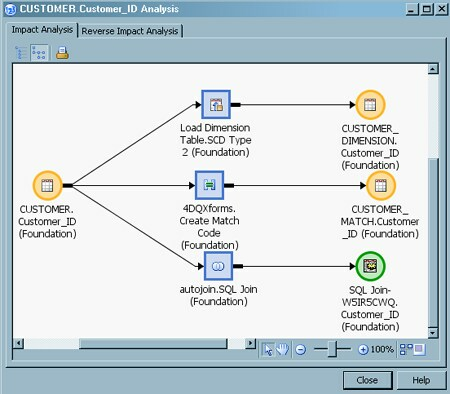 The Diagram View uses a process flow to illustrate the impact of the selected object (Customer_ID column) on later objects in the flow.